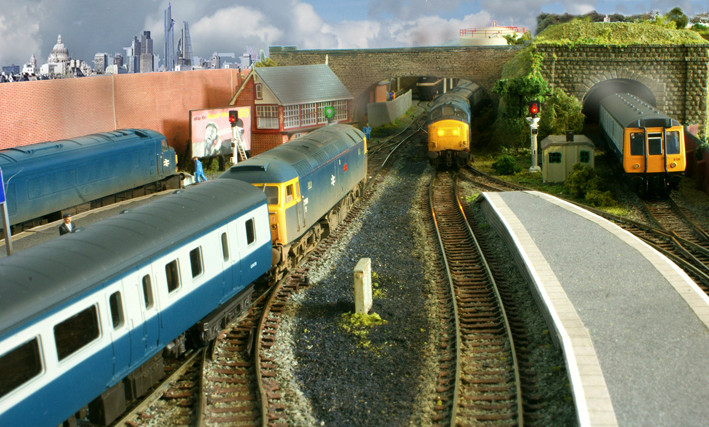 Here we see a busy scene at Sueston station, featuring a number of blue diesels, as captured over the weekend. The photo also serves to show the third, 2-aspect, colour light signal that we installed on Saturday. This latest signal controls trains departing from Platform 1 and this just leaves one more signal to be added to control trains departing from Platform 4. Anyway, back to the photo above where we can see a Class 47 getting the 'green light' and departing Platform 2 with an Inter-City train bound for the North. Meanwhile, a Class 37 approaches Platform 3 with an up semi-fast as a Class 121 bursts out of the tunnel and into Platform 4 with the branch-line service from Saggy Bottom. Finally, standing on Platform 1, is a Class 45 which is held at red whilst waiting for the Inter-City to depart. Once the express has cleared, the Peak will head for the Fuel Terminal to pick up the 100 ton oil tanker that is parked there. This tanker can just be seen, in the distance, under the road bridge.